We helped our little ones become puppies for the day. We painted their noses and helped them make these simple doggy headbands from Family Crafts. Some of them chose to be traditional and went with black puppy noses. Others (like my son) wanted their puppy noses to be orange or blue or purple. 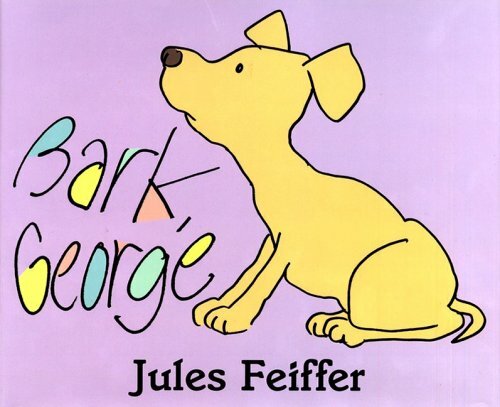 This is a silly, fun read aloud about a puppy who swallows a cat, duck, pig, and a cow. He can't bark, he can only make the sounds of the animals inside of him. The writing is simple, the text predictable. The illustrations are clear and simple. And together they created something magical. The children giggled on each and every page. (and so did their mommies). I borrowed it from a friend. (Although I think one of my kids will be getting this for his birthday next month). I loved it! We used these great print outs from Making Learning Fun to help retell the story. We also sang "How Much is That Doggy in the Window?" , "B-I-N-G-O" and our own song below. The Cat inside George goes meow, meow,meow....all through the town. The person inside George goes "Hello, Hello........"
Materials Needed: Dog Biscuits, cookie cutters in the shapes of the animals in the story, paint, and large paper. Directions: Allow the children to explore with the materials, creating prints, mixing colors. Some of the children made very precise prints with the biscuits and cookie cutters. Others used the dog biscuits as paint brushes. Allow the children to pretend to be puppies and eat them with NO PAWS! Peanut Butter Doggy Toys: Cut the bottom off of a paper cup. Spread peanut butter inside the entire cup and allow children to lick it out. This is similar to the cylinder doggy toys that pet owners can fill with peanut butter. (OBVIOUSLY DON"T USE IF YOU HAVE STUDENTS WITH PEANUT ALLERGIES). This was a last minute idea one of the mommies thought up. I loved it! Thanks, Melissa! Games: "Animal Sound Matching," "Doggy, Doggy Where's Your Bone?," and "Veterinarian Says"
1-Animal Sound Matching - Print these matching pairs of cards They are characters from the story. Give each of the children one of the cards and keep the matching cards for yourself. Hold up one of the cards. The child with the matching card stands up and makes the sound of the animal. Play until all of the children have had a chance to make the sounds of their animals. Then switch and play again as many times as the children wish. 2-Doggy, Doggy, Where's Your Bone? - One child stands up front and a small bone is placed behind him. Another child is chosen to come and get the bone and hide it behind her back. The children all say the poem, "Doggy, Doggy, Where's Your Bone? Somebody took it from your home. Guess who... it might be you." We then allowed the "Doggy" to guess until he found the child with the bone. This is easy to do with only 6 or 7 kids, and then you don't create winners or losers. We try and keep everything cooperative. The child with the bone is the next "Doggy. " Play until everyone has a turn. 3-Veterinarian Says- Played like "Simon Says" but instead we had the children act out animal characters from the book. We play so that every command begins with "Veterinarian Says." 4-Fetch It was raining too hard for us to go outside and play the day we did this theme, but we had planned to go outside and play "fetch" frisbees and balls with our "paws." I am participating in the Read Along on Helping Hands. I'm happy to have found you via Helping Hands! I also am a former teacher who now stays home with my kids, and I have a story time for preschoolers I do once a week at our church. Great ideas! Oh my goodness! Those are some super cute little puppy dogs!!! "There Is a Bird on Your Head!"